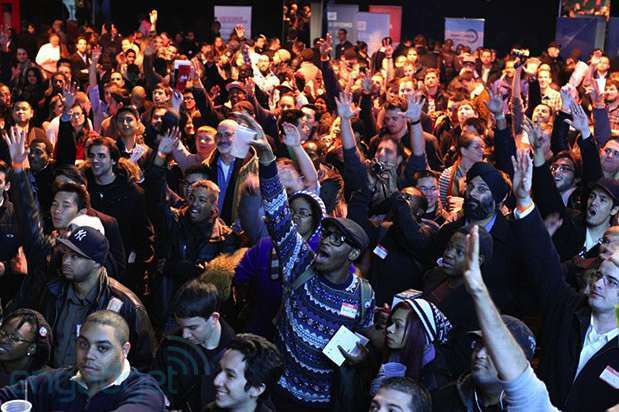 Engadget's New York City meetup wrap-up! Wow. Thank you, New York City! We had a blast at last night's reader meetup, and judging from everyone we spoke to, a Roseland Ballroom packed full of Gotham gadget geeks had a grand 'ole time as well. Twelve lucky readers walked away with a Samsung Galaxy Note II on Sprint and nearly 30 people took home house cleaning bots from the folks at iRobot -- not to mention the Nook tablets, Oakley Airwave goggles and VestGuard UK Ballistic bulletproof case and iPad, to name but a few. We tested readers' tech (and Wu Tang) knowledge and dancing and singing skills. There were booths from Sprint, Samsung, Garmin, Speck, Dell, Barnes & Noble, MakerBot, iRobot, Oakley and GoGo Inflight, or as attendee Peter M. put it, a "mini-CES meets A Night at the Improv." Relive the magic in the gallery below. Gallery: Engadget's New York City meetup wrap-up!